Dear Zucchini Diary: Zucchini Chips Ahoy! Remember when I warned against letting squash sit too long on the vine? This squash grew to a comical size while we were on vacation. Oops. Baking variations are tricky beasts, because most of baking is chemistry. It’s not like soup (spice it to your liking) or roasting meat (it’s done when it hits this temperature). With baking, there’s rising — and falling. Will it firm up? Will it overflow the pan? 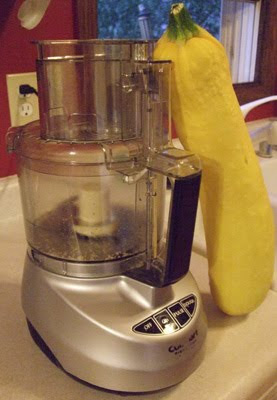 About four inches from this giant squash was 2 cups, shredded. And there’s still A LOT of squash left! These cookies taste better the second day. Store them overnight in a tight container on the counter. I think the tasty secret to these cookies is the almost-ground macadamia nuts. I dumped about 4 ounces of whole nuts in the food processor, and they didn’t chop very evenly. But that’s OK; they give the cookies a rich, nutty taste and texture. But it wasn’t! Not at all! I’m not sure I would follow the original recipe because I like this outcome so much. I have, my hand to God, baked zucchini-laced Chips Ahoy cookies. They’re really soft yet not underdone. And even if you were looking for it, you’d be hard-pressed to ID the vegetable in these cookies. Dear Zucchini Diary: Today I found baking serendipity. This recipe shows the doubled amounts I used to get 71 cookies. If you do not want 71 cookies (though I can’t imagine why this would be the case), cut these amounts in half. Combine eggs, butter, brown sugar, white sugar, and vanilla extract in a large bowl. Beat until well combined and light and fluffy. Stir (or sift, if you’re feeling ambitious) together flour, baking soda, salt, cinnamon, and nutmeg in a separate bowl. Add dry flour mixture to wet mixture a bit at a time, taking care that each addition is well combined. Add zucchini, chocolate chips, and nuts, and use your hands to evenly distribute the add-ins. 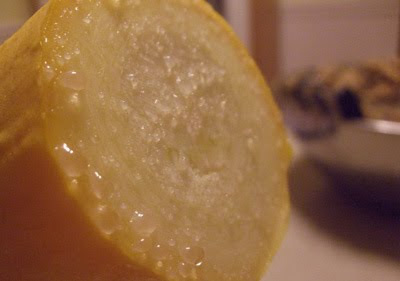 The mixture will become very sticky. The dough waits for free spots on a baking sheet. I mixed the dough with my hands because I was worried that it would strain my stand mixer. If you make a single batch, a mixer should handle it. But I played it safe. 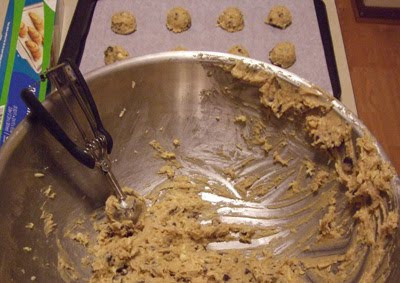 Drop dough onto parchment-paper-lined baking sheets using a size 40 (1 1/2 tablespoons) cookie scoop. Bake cookies for 6 minutes, rotate tray(s), and bake for another 6 minutes. Remove cookies from oven; let them cool on tray for 5 minutes. Take cookies off tray and place them on a cooling rack. 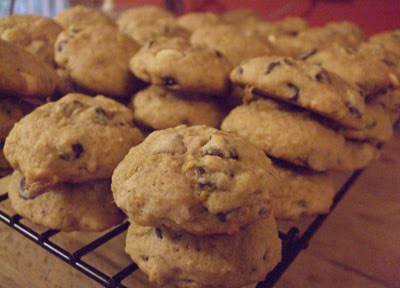 Makes 71 medium-sized, nicely domed cookies. Chips ahoy!